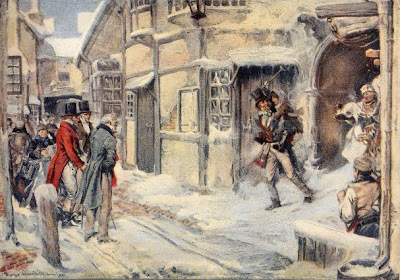 In his "Ghostly little book," Charles Dickens invents the modern concept of Christmas Spirit and offers one of the world’s most adapted and imitated stories. We know Ebenezer Scrooge, Tiny Tim, and the Ghosts of Christmas Past, Present, and Future, not only as fictional characters, but also as icons of the true meaning of Christmas in a world still plagued with avarice and cynicism. The text of the book is in public domain and available for free download. Is it possible to buy this digital picture for print and display in a decoration for a christmas carol cave? The printsize will be about 4 meter on 100 dpi.